About a year ago, a start-up US magazine called Nanny Magazine approached me and asked if I would like to contribute some recipes to their maiden print issue. They were looking for recipes that were both heart-healthy, child-friendly and simple to create. It still astonishes me how blogs can connect people from across the globe (a shout out to my non-UK readership *waves*) so I was happy to help! This recipe was printed in the January 2014 issue and it has to be both one of the yummiest and healthiest breakfasts in my repertoire. 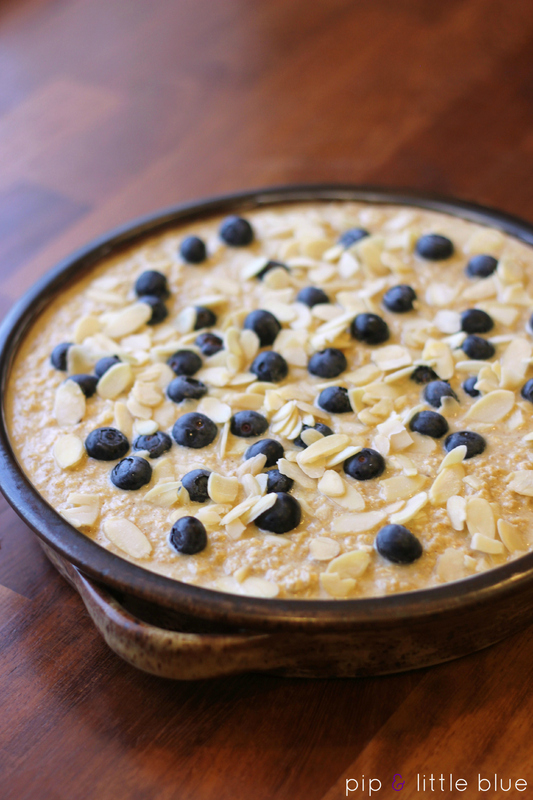 It may feel like you’re indulging and eating cake for breakfast (which is fine, by the way), but this is jam-packed full of blueberries, oats, soy milk and almonds, all proven to be good for your heart and low in fat to boot. Way way better than porridge. Perfect for those who are, like me, a bit rubbish in the morning – just bake on Sunday, reheat a slice each morning (or eat cold) and you’re sorted for the week. Apologies to my non-US readers – the measurements are currently in cups. *Substitute with dairy-free spread for a dairy-free version. **Make sure you use gluten-free certified oats and gluten-free baking powder for a gluten-free version. Preheat your oven to 190ºC / 375ºF and grease a 9 inch baking tin or dish. In a large bowl, cream together the margarine and sugar. Beat in the eggs, milk and vanilla extract. Stir in the oats, ground almonds, baking powder, cinnamon and salt until all the ingredients are incorporated. Arrange 1 cup of blueberries on the bottom of your baking dish. Spoon the oatmeal mixture on top, even the surface out and scatter the flaked almonds and remaining blueberries on top. Bake in the oven for 40-45 minutes, or until the oatmeal is springy and golden on top. Serve warm as is, with extra fruit or a splash of milk. 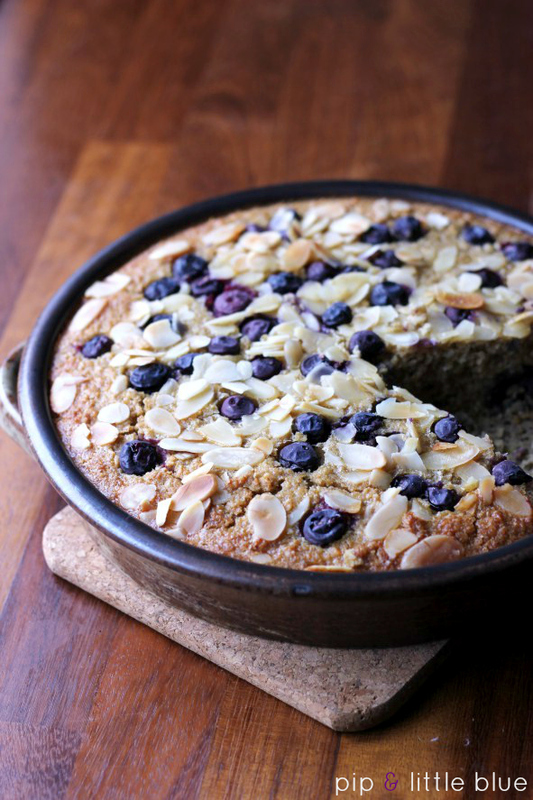 Tags: almond, baked oatmeal, Baking, blueberries, breakfast, brunch, dairy free, easy, gluten-free, heart healthy, recipe, soy milk. Bookmark the permalink.